Follow the Money: Why Do Universities Oppose the Higher Education Bill? When 39 university associations send an open letter to Congress expressing “grave reservations” about proposed legislation, you can be sure that money is involved. No matter how they describe their concern about students, our colleges and universities have spent money at a pace well above inflation for decades, and they have raised tuition and fees in tandem. The federal student loan program has been their “enabler,” so they want to keep the money flowing. New buildings, new stadiums, fitness centers, luxury apartments, a “lazy river” at Louisiana State University, climbing walls at Notre Dame and Rutgers, and a $120 million refurbishing of a student center at North Carolina State—these are increasingly typical at schools that older alumni remember as spare, even spartan. The universities’ letter, sent in February, was sponsored by the American Council on Education. It attempted to derail the PROSPER Act (Promoting Real Opportunity, Success, and Prosperity through Education Reform Act). Lobbying continues as the House of Representatives comes closer to bringing the bill to a vote. The Council’s letter claimed that the bill would “reduce federal aid to students by nearly $15 billion” and would leave “all students worse off.” It cited the Congressional Budget Office (CBO) as the source. This claim is misleading, however. CBO, which estimates the costs of proposed legislation, said the bill would reduce direct spending on student loans by $14.6 billion from now to 2027, but it would also “authorize the appropriation of $112 billon over the 2018-2022 period and $210.4 billion over the 2018-2027 period.” The largest part of those authorized increases (which means increases at the discretion of Congress) would come from changes in Pell grants. 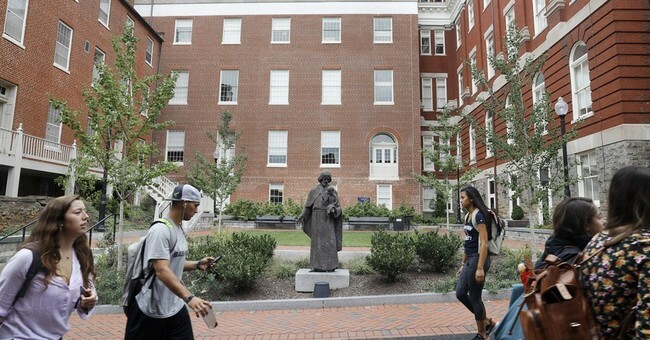 Pell grants arenotloans and are designed to increase access for low-income students—something that universities usually mouth great support for. What seems to stress out the universities is that the automatic spigot of money they have been getting from student loans may flow less freely. And there’s a good reason: Students are borrowing money to attend school, and yet 40 percent fail to graduate, even after six years. Student debt is now around $1.4 trillion. Students who drop out face loan payments that they can’t handle—and are often surprised because no one had explained to them how much they would have to pay. While many successful students can handle their loans, those who quit suffer twice: They owe money; but without appropriate education, many can’t get a good job to pay their debt. These students would have been better off if they had taken practical non-college postsecondary schooling. Making students aware of the costs of a four-year degree and of alternative educational opportunities is one goal of the legislation. “Businesses and industries are desperate for skilled employees,” said U.S. Rep. Virginia Foxx (R-NC), who sponsored the bill, in a recent interview. Foxx wants public policy to use the term “postsecondary education,” not “higher education,” because a bachelor’s degree is not the only route to success. “We want to see more Americans get the education they need to enter the workforce,” Foxx added. The bill aims at helping people, not universities. That means overturning many of the assumptions that have operated for years. One is that college is the only way to success. Another is that loans are the best way to college. PROSPER would remove many of the hoary accretions that have developed since the Higher Education Act was first authorized in 1965. For example, the bill allows Pell grants to be used for short-term education programs, far better for many students than trying to get a bachelor’s or even an associate’s degree. The bill adds a Pell bonus for swift completion of courses, simplifies the loan application process, and reduces the dizzying array of loan programs. It protects religious freedom on campus. It increases universities’ transparency about the success of their programs. It requires due process for those accused of sexual assault. It does away with the discriminatory Public Service Loan Program, which gives special repayment treatment to those who go into the government or “public service” organizations. The bill endorses the use of competency-based educational progress as an alternative to the traditional credit-hour model. And most universities don’t like that.